Introducing the Canon imagePROGRAF PRO-1000 17" Wide Format Professional Printer with an 11-Color plus Chroma Optimizer ink system that does it all. 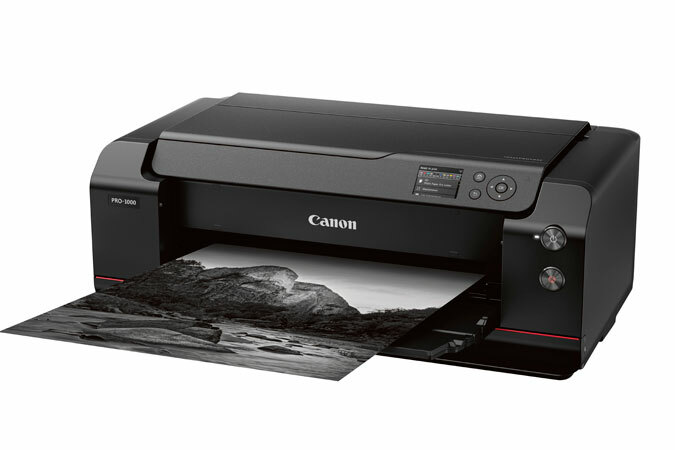 Marked with the distinctive red line normally found on Canon's professional lenses, the PRO-1000 is designed to offer users large-format print sizes with exceptional image quality. This printer leverages the outstanding FINE (Full-Photolithography Inkjet Nozzle Engineering) technology with a 50% larger print head than previous offerings and the 11-color LUCIA PRO pigment-based ink set and Chroma Optimizer to create prints with fine detail and a wide, accurate color gamut. The PRO-1000 also offers the largest print size in the imagePROGRAF line, up to 17" wide, and can print borderless at up to 17 x 22" as well as work with thick 27.6 mil fine art media. Equipped with the L-COA PRO Image Processing Engine, the PRO-1000 can quickly and accurately determine printing paths and patterns in order to work as quickly and efficiently as possible. This enables bordered 17 x 22" photos to be created in just 4 minutes 10 seconds while a two-way vacuum feeder keeps media flat and quickly, accurately feeds the media. Also, to expand on the capabilities of the LUCIA PRO ink set, it offers four monochrome inks that reduce bronzing, increase black density, and expand dynamic range in the shadows for excellent grayscale prints. Additionally, the Chroma Optimizer cartridge improves color consistency on coated papers and reduces the difference in ink droplet height to ensure a smooth ink layer and less metamerism. A 3.0" color LCD is available on the front of the unit for easily viewing settings and making adjustments. Also, connectivity is a highlight of this model with USB 2.0, Ethernet, and Wi-Fi options available. 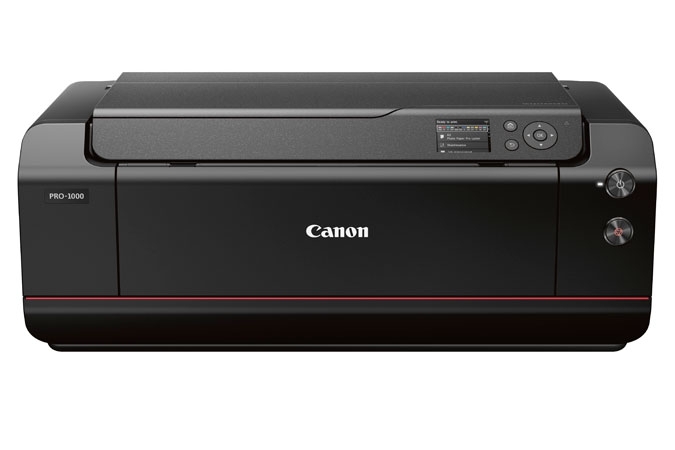 Wireless printing furthers the printer's overall capabilities by adding compatibility with Canon's PRINT App and PIXMA Cloud Link. The mobile app is available for iOS and Android devices and allows users to quickly transfer images and files for print as well as monitor the printer's settings. PIXMA Cloud Link provides access to Google Cloud Print for printing documents directly from cloud-based servers. Anti-Clogging Technology - The fine print head institutes a tubular ink delivery system. This generates faster print speeds and reduces the possibility of clogging. Additionally, ink ejection conditions are precisely checked with sensors, and if a clog is detected, another nozzle automatically provides backup. In addition to preventing wasted prints due to clogging, this also reduces the frequency of which nozzle cleaning is required. Air Feeding System - The Canon Air Feeding System prevents each page from skewing for accurate ink placement, regardless of paper type. A series of openings located on top of the platen vacuum-grip the paper as it feeds through the printer. The Air Feeding system creates a printing environment that keeps a consistent height between the print head and the media being used. Variances in height can occur due to paper curl or variations in temperature and humidity. A consistent level surface leads to remarkable ink droplet accuracy and improved image quality. Lucia Pro Ink System - The Lucia Pro 11-color plus Chroma Optimizer ink system satisfies the demands of the most critical photographer or graphic artist. Denser droplet placement provides a broader color gamut and improved gloss uniformity for superb glossiness and anti-bronzing. Incredibly accurate color reproduction, outstanding image clarity, and enhanced detail in darker areas distinguish each print. On fine art papers, higher black density renders even the finest shadow detail, for a print that becomes a work of art. Black Density and Dark Shadow areas- Deep blacks, which make the image crisp, and precise gradation can be attained across all media types. On glossy media, light reflection off of a printed image is stabilized by the Chroma Optimizer and Photo Black ink. Overall, your images will enjoy an enhanced dynamic range. Wide Color Gamut - An improved ink system adopts 11-color inks and Chroma Optimizer ink. This system helps you achieve an improvement in color-reproduction, image clarity, and enhanced darker areas. It faithfully reproduces colors and dark areas crucial for printing works of art. The improved formulated blue and magenta inks will help recreate the finest details when printing gorgeous nightscapes and beautiful sunsets. No Switching of Black Inks - On other printers, switching from Matte Black to Photo Black consumes a significant amount of ink and time. The imagePROGRAF PRO-1000 is designed to work seamlessly when changing media types. Matte Black and Photo Black inks have their own dedicated nozzles, so no switching is necessary. You can print on fine art paper then glossy paper with no worries, no changes, and no waste. Fast Photo Printing - At the heart of the imagePROGRAF PRO-1000 is a 1.28" wide print head. Expanding the printing area by 50% with each movement of the print head, print speeds are drastically improved. This increases your productivity through efficient high-speed printing. Print Studio Pro v. 2.0 Plug In - This powerful plug-in software provides professional photographers with intuitive printing solutions. Printer Management Solutions - Every detail in your print must be perfect, why not have the same obsession for your workflow? The imagePROGRAF PRO-1000 is precisely managed with these powerful management tools.